I have had my eye on the Sephora Teint Infusion ever since it launched a month or so ago exclusively online at Sephora.com, I was hoping that maybe this could be a close dupe to my coveted Giorgio Armani Maestro. The only thing that stopped me, was the fact that I didn't know exactly what shade I would be as there are 18 shades and I don't want to order a few for no reason, or have to make the trip to return it in store. Anyways, I went to Sephora Eaton Center on Friday and they had these in stock finally. Excited, I went to swatch it with my friend, and well we both came to the consensus that this really isn't comparable to the Giorgio Maestro Foundation. Both of these are packaged quite similarly as you can see, I have used the Giorgio one on and off, however it is quite pricey and I haven't restocked since. The Maestro comes in a dropper form, the liquid turns into a powder finish when applied, same goes for the Sephora one. However, the Sephora one almost had a greasy oil finish and wasn't as smooth as the Giorgio. I think that I will definitely be sticking to the Giorgio - if you break it down - the Giorgio is only a bit more considering the Sephora, although $30 has only 0.67oz - which is about 3/4 of the Giorgio - so technically you're paying approx $15-$20 more for the full oz from Giorgio. Have you guys tried either of them? Thoughts? I know alot of companies have similar concepts - i.e. 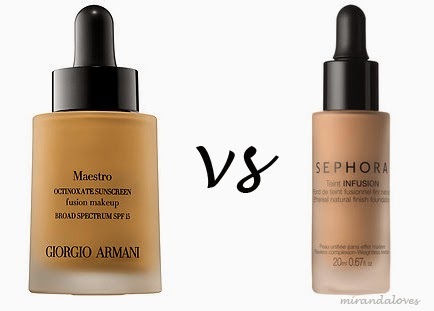 lancome, however I have only had experience with the Giorgio and the Sephora, so I am only extending my opinions towards these two products that I found are the most similar.